Yesterday, Captain Rick Sullivan chatted with us in Dizzy's Jazz Bar. His warm demeanor and superb sense of humor have made sailing aboard Royal Caribbean Explorer of the Seas a sheer delight. 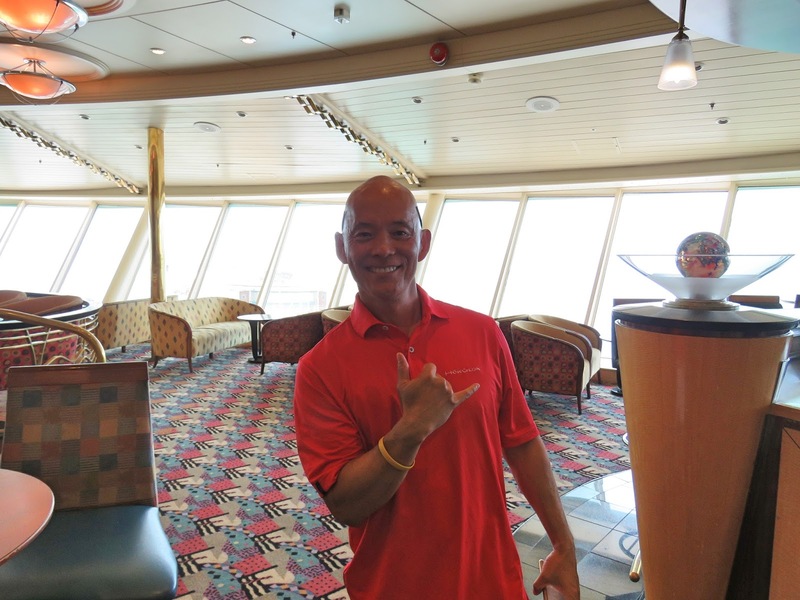 With plans to take the tender to Kailua-Kona, we busily prepared the day's post while seated in the Diamond Club Lounge on deck 14, our favorite morning spot on this 24-night cruise. After Tom stepped out to head back to the cabin for a few minutes, I stayed behind with my fingers flying across the keyboard in an effort to get the post uploaded so we could take off for a walk at the cruise port of call that requires a ride on the tender. The group of dignitaries from Kailua-Kona, Hawaii came aboard to present Captain Rick with a plaque welcoming the ship to the city. At the time I was the only passenger in the Diamond Club, keenly aware of the quiet and serenity, usually lacking aboard this particular venue. A cloudy day, we weren't in too huge of a hurry to go ashore but, in typical Hawaiian style, a cloudy day could easily and quickly turn into bright sunshine. Stopping to contemplate my next line of type, the door to the Diamond Club opened with a key card and in walked our ship's Captain Rick Sullivan. Having heard him over the loudspeakers, enjoying his lively and humorous demeanor and, seeing him wandering about the ship engaging so freely with passengers, I had no doubt it was him. During the presentation...the official from the Mayór's office and Captain Rick. Let me clarify...we aren't Captain or otherwise groupies. After all of our years of world travel, we've come to realize and embrace the fact that us humans are all alike in many ways regardless of ethnicity, celebrity, financial status or notoriety. We've never attempted to dine with a ship captain, meet with a ship captain or engage in any particular conversation with a ship captain. We always felt we could leave that up to those who found it most appealing and vital to their personal experience. A representative from the Mayor's office in Kailua-Kona and Captain Rick. For us, we are always able to glean the best experiences from engaging with anyone of any culture, whether it be a local carrying a basket of fruit on her head or a local taxi driver scurrying us around. They all matter to us. As he entered the room with a wide and warms smile on his face, he suddenly fell into the category of another kindly human open to engaging in conversation with a fellow human in his path. Easily, the conversation flowed and in no time at all, we were sharing personal anecdotes. Moments later, Tom entered the room and without missing a beat, in Tom's usual welcoming manner, stepped right into sync into our discussion. After a chat, Captain Rick, upon hearing about our website, invited us to attend the upcoming presentation by local officials, marine and city staff to present Royal Caribbean Explorer of the Seas with a welcoming plaque for its first destination port of call in Kailua-Kona, Hawaii. Plaques and gifts exchanged between the city and the ship. The presentation was scheduled within the hour in the bar/lounge Dizzy's Jazz Bar located outside the door of the Diamond Club. Captain Rick suggested we sit and chat in the bar while we wait. Captain Rick also presented a plaque to the city of Kailua-Kona, Hawaii. The conversation flowed with ease as we shared our story of world travel, our site and the reasons we decided to travel the world. In turn, Captain Rick shared his story including his vast experiences at sea, all of which further exemplified the fine details of the life of this special man. When the guests arrived, Captain Rick reminded us, as he stood to greet his guests, to stay put and embrace the experience taking as many photos as we desired and joining in conversation with the group. The gathering took place in Dizzy's Jazz Bar on deck 14, outside the Diamond Club Lounge. In respect for the event, we stayed back a little but in no time at all we were approached by a few visitors, not hesitating to share in the conversations. What a pleasant surprise to our day in Kailua-Kona, unanticipated and surely serendipitous, as are many of the memorable events in our lives. We enjoyed speaking to Mark one of the representatives from the city. 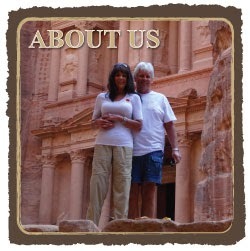 It never seems to be about the tourist sites, the organized tours, and old buildings. The best moments are always about the creatures God placed upon this Earth, both human and animal. We're grateful...forever grateful..and eternally humbled by that which crosses our path on this worldwide journey. The two Katuts and Ribud (the pool and landscape guy) holding up the three kilo Blue Fin tuna for our next meal. After it was cleaned and filleted there were two huge portions which we're sharing each night. Such wonderful people! Such fabulous fish! For more details, please click here. Re your post from the other day on probiotic treatment for helicobactor pylori, you may want to check this from the National Institute of Health. Susie, thank you so much for this great article. I read every word and am further convinced big doses of probiotics is the way to go. Thank you kindly for sending this information! Its very much appreciated.